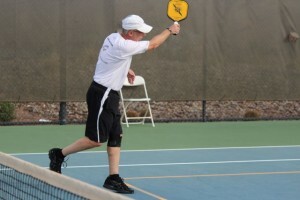 WOW, Pickleball Rocks at the 2011 Nationals! Wow, wow and yes, WOW! Can’t think of a more appropriate way to describe the experience at my first National Pickleball Tournament. What a great week of fun, friendship and pickleball competition. From the moment we pulled into the parking lot, I knew this was going to be fun. Big white tents full of vendors selling anything you can put the word pickleball on. Pickleball paddles everywhere and the main corporate sponsor, My Retirement Direct, giving out goody bags stuffed with tshirts, water bottles and yes, retirement info. First stop, the registration tent, where they were actually expecting me. 🙂 Apparently my entry form did get to the right people. Next, I filled out my free USAPA raffle tickets and dropped them off with one of the great ambassadors of our sport, Nancy Jordan, who was excitedly manning he USAPA membership tent. Hope we added some members this week. I’m sure we did. 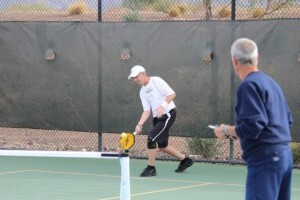 Next I got the lay of the land with a quick walk around the beautiful Pickleball complex at Sun City Festival. 18 courts had been carefully cleaned and lined for this great event. It was fun to see the arrival of old midwest friends like Don and Haroline Walker, Lynn Carlson, Al Hager and Jim and Yvonne Hackenburg. It was a great showing for the midwest as all of them took home national hardware. Congratulations guys! It was equally fun to meet up again with some of my newer friends whom I’d recently met at the San Diego tournament at Oceanside. Ken Follis, Kevin Martzolf, Sue and Dominic Ambrosino, Randy and Jennifer Zbinden, and Bev and Bob Youngren. 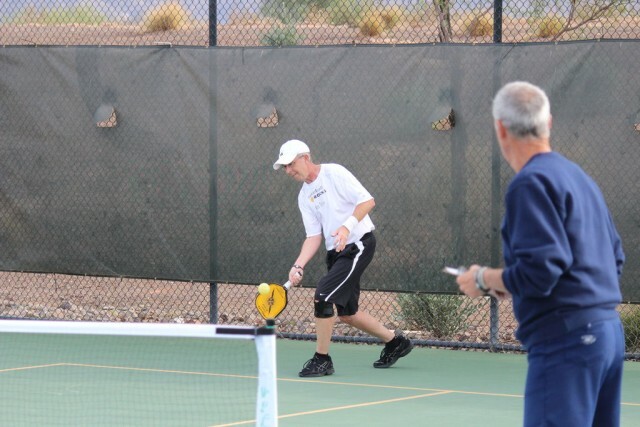 What great ambassadors they are for California pickleball. As for the competition??? There was plenty. We did manage to come back and win our second match before bowing out much earlier than planned. In singles, I managed a bit better. I won a couple close contests and lost a very tough battle with the eventual Gold Medalist. Congratulations Dan Wheeler on your Singles Gold Medal. Well deserved. It was all fun, but I believe the highlight of the week was just the incredible bunch of new friends that we made along the way. 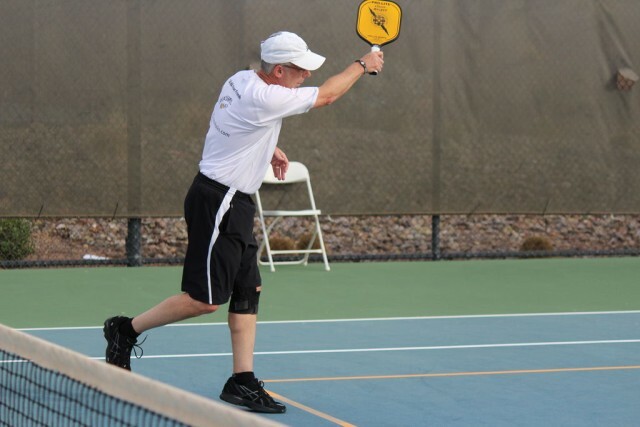 Once again, and I know I’m preaching to the choir here, pickleball wins because of the people who play it and support it. Thank you everyone for a tremendous first National tournament.